Grandma's simple sponge cake recipes for making versatile light-textured cakes that you can easily layer for special occasions. 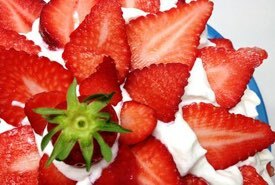 Serve with whipped cream and jam, preserved fruit, or with fresh berries in season. They also look dainty and inviting when simply topped with a sprinkling of icing sugar. These old fashioned cake recipes are great for making cupcakes too. To brown Sponge Cakes, do not paper the cake tins, but rub with melted lard and then sprinkle with fine sugar. Beat eggs until very light. Add sugar and beat again. Sift the flour and cream of tartar together. Dissolve baking soda in the water, and add to the eggs and sugar, mixing in the flour at once. Flavor to taste, and bake in a moderate oven for 30 minutes or more. Break eggs into a cup, then fill cup with milk or cream and add to mixing bowl along with other ingredients. Beat hard for 5 minutes. Bake in moderate oven (350°F) for about 10 minutes in a muffin pan. Sift flour once, measure, add baking powder and salt, and sift together three times. Add sugar gradually to beaten eggs, beating well. Add lemon juice and boiling water, then add flour, mixing thoroughly. Bake in 8x8x2-inch ungreased pan, in moderate oven (350°F) for 40 minutes, or until done. Method: Beat egg yolks until thick and lemon colored. Gradually beat in sugar, which has been sifted, the lemon rind, and extract. Add salt to egg whites, beat until they are frothy. Fold part of the whites into the yolk mixture, then the sifted flour, and the balance of the egg whites. Sugar, 1 cup; 4 eggs; sweet milk, 3 tablespoonfuls; flour, 2 cups; baking powder, 2 teaspoonfuls; salt, 1 pinch; orange or lemon extract, 2 teaspoonfuls. Directions: Beat the eggs, then beat in the sugar, add the milk, salt, and flavor; and, having mixed the baking powder into the flour, sift it in, beat all together, and bake in a quick oven. Remarks. —This will make 2 cakes if baked in the round tin, or 1 in the square. I have eaten of this many times with great satisfaction, and expect the same in eating of the one which, I am just informed, is ready for tea. Yet, I give several others to meet all circumstances and desires. Sponge cake is credited with being the most healthful of any form of cake, for the reason that, as a general thing, no butter or other shortening is used, although of late, as will be seen below, some people are beginning to introduce them; but, for myself, I am very fond of one of the above, coming warm from the oven at tea time, having some very nice butter to eat with it. Sugar, 1 cup; flour, 1 cup; 3 eggs; water, 2 tablespoonfuls; baking powder, 2 teaspoonfuls; salt and spice to taste. Directions: Beat the whites and yolks separately, and add the water the last thing before baking. The following is from somebody's lady friend, as the result of long experience: "Flour, 1 cup; sugar, 1 cup; baking powder, 1 heaping teaspoonful; cold water, 3 tablespoonfuls; flavor with lemon or vanilla." Molasses, 1 cup; melted butter, 1 tablespoonful; 2 eggs, well beaten; sweet milk, 1/2 cup; cream of tartar, 1 teaspoonful; soda, 1/2 teaspoonful; flour 1-1/2 cups; ginger, to taste. Makes a good loaf, or it may be baked in layers and laid up with jelly for variety. 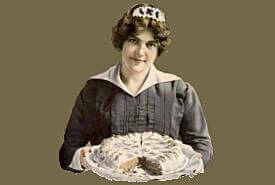 Butter, 1 cup; sugar 2 cups; flour 1-1/2 cups; 6 eggs; cream of tartar, 1 teaspoonful; soda, 1/2 teaspoonful. Directions: No special directions given, except to dissolve the soda in a tablespoonful of the milk, and mix the cream of tartar evenly with the flour, which is in accordance with my general directions. Remarks. 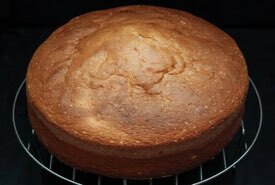 —As this simple sponge cake recipe shows how a farmer's wife, of White Church, Kansas, makes her cake, I thought I would give her directions in full. It will be noticed that this cake is rich in eggs and butter; but if the Kansas farmers can not afford it I do not know who can. Sugar, 2 cups; 4 eggs; flour, 3 cups; cream of tartar, 2 teaspoonfuls; soda, 1 teaspoonful; salt, a pinch; cold water, 1 cup; the juice of 1 lemon. Directions: Beat the eggs well, then beat in the sugar and half of the flour, in which the cream of tartar has been mixed; the soda and salt being dissolved in the water, add in with the lemon juice, and lastly the balance of the flour, stirring well together, and bake in cakes to be fully 2 inches thick. Milk, a scant 1/2 pint (take out a little to wet up 3 teaspoonfuls of flour); sugar, 1 scant cup; butter half the size of an egg; 1 egg, well beaten; flavor with the grated peel of the lemon. Mix all, and cook for 15 minutes in the rice-boiler (double boiler) then set aside to cool. This should be done so as to be cold by the time the cake is done. 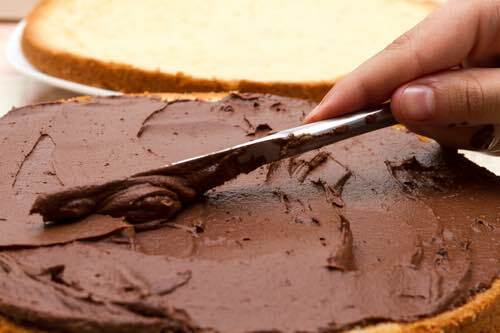 Split the cake with a sharp knife, and spread the cold custard between. Sugar and flour, each, 1 cup; 3 eggs; sweet milk, 3 tablespoons; melted butter, 2 tablespoonfuls; baking powder, 2 heaping teaspoonfuls; extract of lemon, 1/2 teaspoonful. Gertie, of Kewanee, Wis., prefers cream in hers, as follows: Beat 2 eggs in a teacup, fill up the cup with thick sweet cream, 1 cup of sugar, 1 cup of flour, 1 teaspoonful each of cream of tartar and soda. Sugar, 1 cup; 1 egg; sweet milk, 1 cup; butter the size of an egg; baking powder, 2 teaspoonfuls; flour, 2 cups; season to taste. Remarks. —The more frequent use of sponge cake, as compared with other kinds of cake, is the reason of my giving so large a number of them, that everybody may be suited. 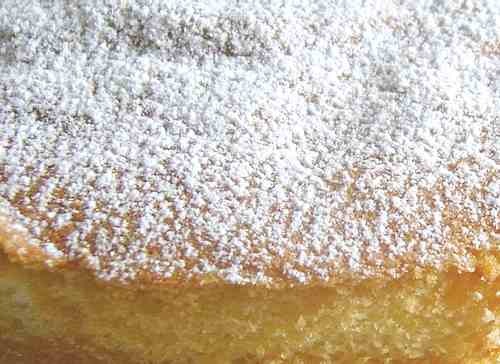 Sponge cakes traditionally feature flour, sugar, and eggs as their main ingredients. Their light, bubbly texture is reminiscent of a sea sponge. Historically one of the first non-yeast cakes, a sponge cake's distinctive bubbly batter is created by thoroughly beating the batter to incorporate the air, or by using baking powder or baking soda as leavens. Reflecting on their sponge-like texture, I can recall spoiling one of Mom's freshly made sponge cakes when I was very young. Fascinated by the name "sponge" cake, I attempted to use it like a sponge in the dishpan when she wasn't looking. As expected, it was a mistake that I quickly regretted since Mom had made the cake for company soon to arrive. These dessert cakes are quite versatile, making great dessert cakes on their own, or if they're baked thin, they can be rolled before cooling to form jelly rolls and Swiss rolls. They are also perfect for use in puddings, trifles, and shortcakes. Queen Victoria was known to love a piece of homemade sponge cake with her afternoon tea. Known as Victoria Sponge or Victoria Sandwich Cake, it was served split with raspberry jam that was spread between its layers, the jam sometimes mixed with whipped cream, and its top sprinkled liberally with powdered sugar.